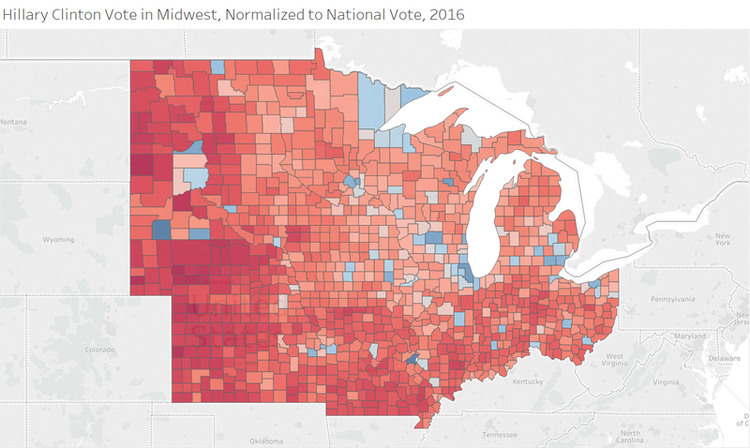 We now turn our attention to the biggest prize of the 2016 election: the Midwest. This region has largely been where our national elections have been won or lost since the Civil War. Republicans knew that they could not win the presidency without this area; hence all but three of their nominees from 1868 through 1920 hailed from the region (Democrats tended to counter with presidential candidates from electorally rich New York, but all but three of their vice presidential candidates during this time period were from the Midwest). Donald Trump picked up a whopping 50 more electoral votes from this region than Mitt Romney did, and very nearly added 10 more. Moreover, these pickups largely surprised analysts. It is therefore useful to spend some time looking at how it happened. We’ll start this time with maps, then charts, then some more maps. 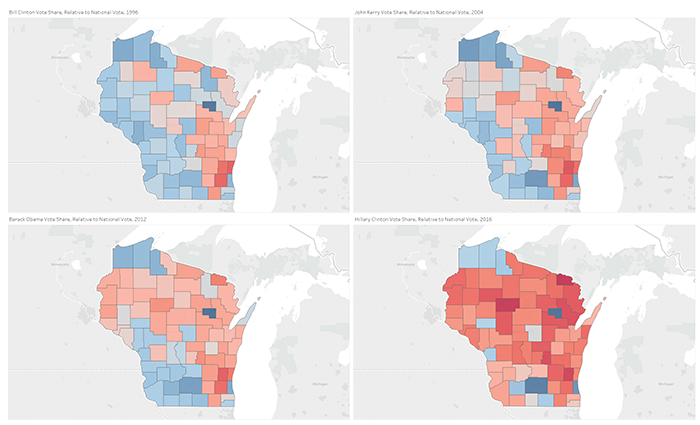 What we’ll see is that the contagion that RealClearPolitics identified in a 2009 series on the Obama coalition spread throughout the region, just as it did the other regions of the country: Democratic strength in rural areas collapsed. But unlike the West and Northeast, it mattered here. So we start with Michael Dukakis’ map. What I’ve done here – as with most of the articles in this series – is subtracted out the national vote. 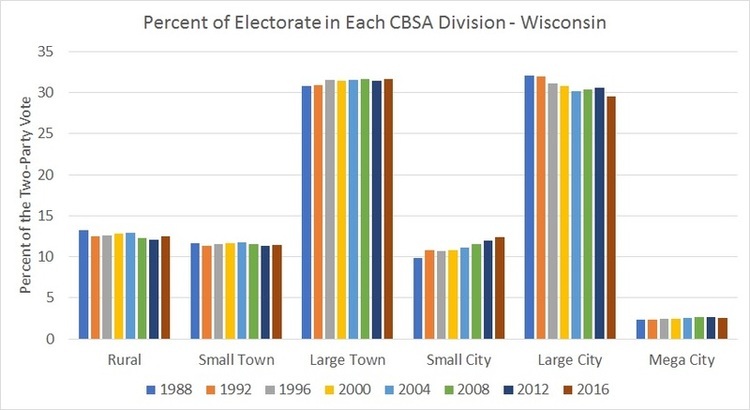 This allows us to compare counties where Democrats won by large margins (as in 1996) with elections where they didn’t fare as well. 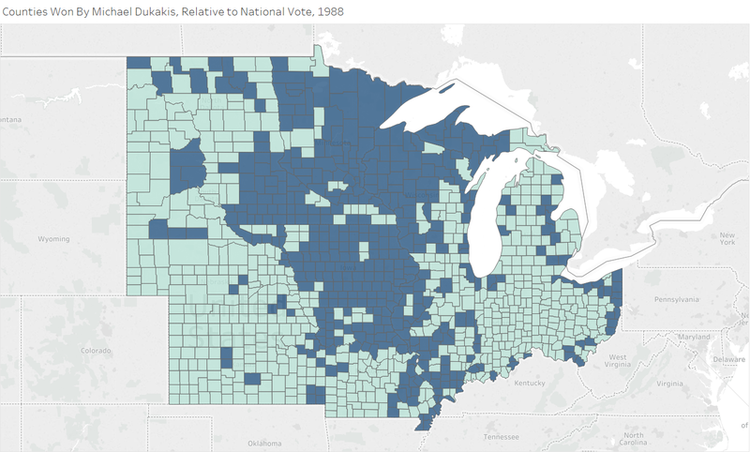 So what this map shows are counties that Dukakis won, as well as counties that he lost, but by less than his national margin. In 2008, Barack Obama won a substantial victory in the region, comparable to Bill Clinton’s win in 1996. Yet his coalition was much narrower, and dependent upon strong showings in the cities. Note that South Dakota and North Dakota were both single-digit states in 1996 (South Dakota went for Dole by three points), but no longer. Note too the pattern in Missouri; this is consistent with the state’s settlement pattern, where the band through the center of the state was settled by Republican-leaning Germans, while the northeast and southeast were settled by people from Mississippi; the electoral patterns there follow, to some degree, the trends in the Magnolia State. 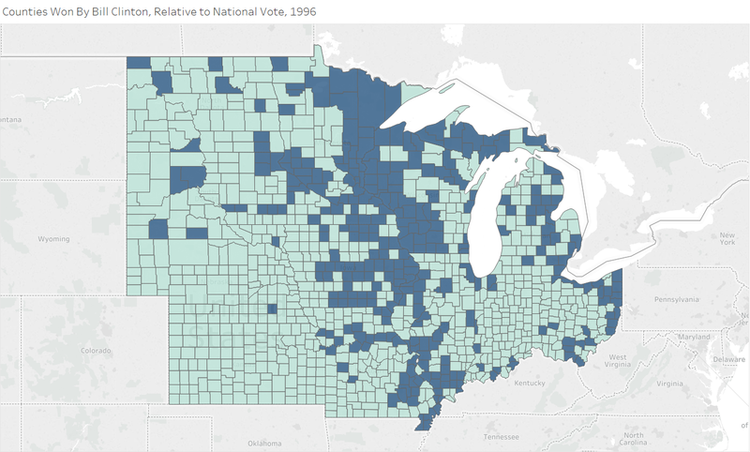 These voters kept the Democratic Party of Missouri afloat for decades, but no longer. 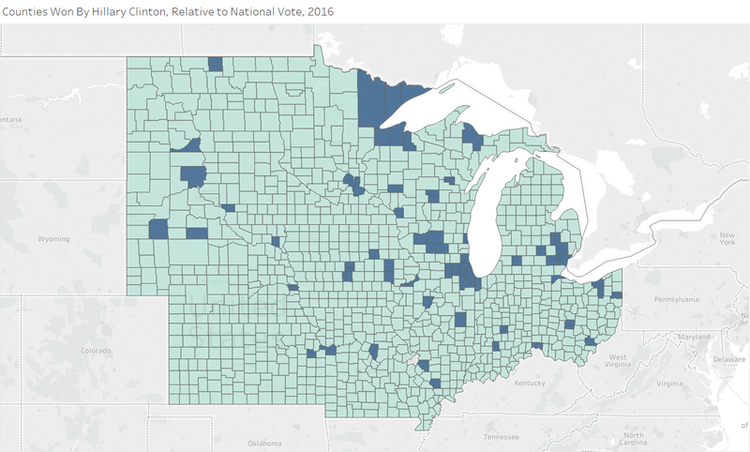 Of course, counties don’t vote; people do. We don’t mean to suggest that this coalition is useless, as many of those places that cast a lot of Democratic ballots also have a lot of voters. We simply use these maps to illustrate how wide-ranging some of these changes are. This becomes more apparent when we look at the distribution of votes here. By now, these trends should look familiar. 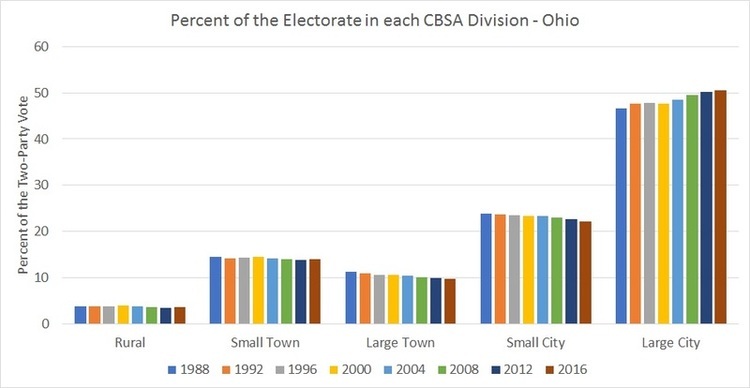 Hillary Clinton improved over even Obama’s vote share in the “Mega City” areas. 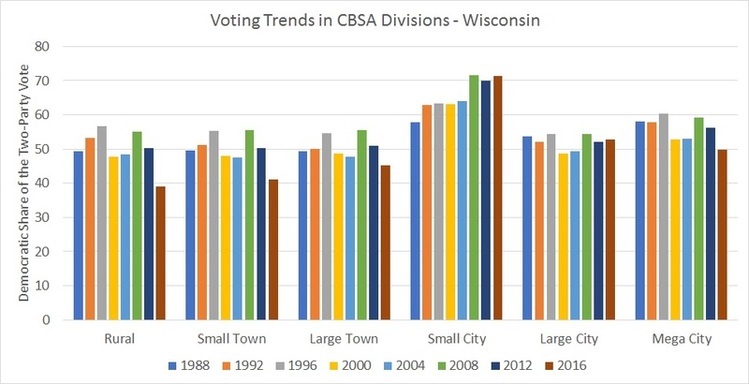 But she fell back to 2000 and 2004 levels in the “Small City” and “Large City” areas, and then fell behind Dukakis in the towns. 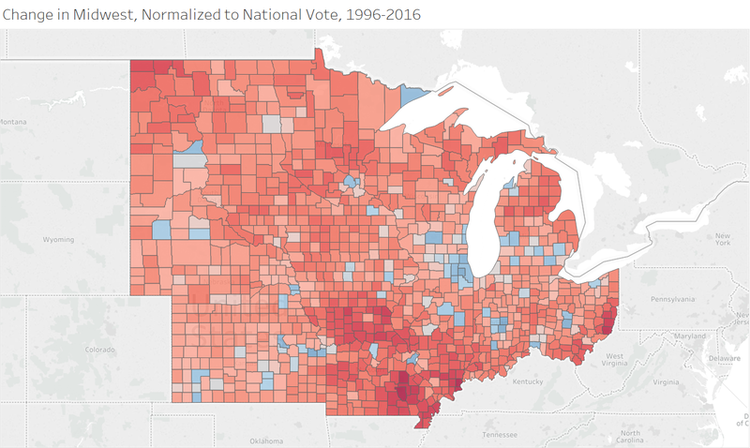 In fact, in large towns she had the worst Democratic showing since 1988, while in rural areas and small towns she had the worst showing since 2004. In the rural areas, she ran over 15 percentage points behind Dukakis. This is what we mean by the contagion in the Democratic coalition spreading. 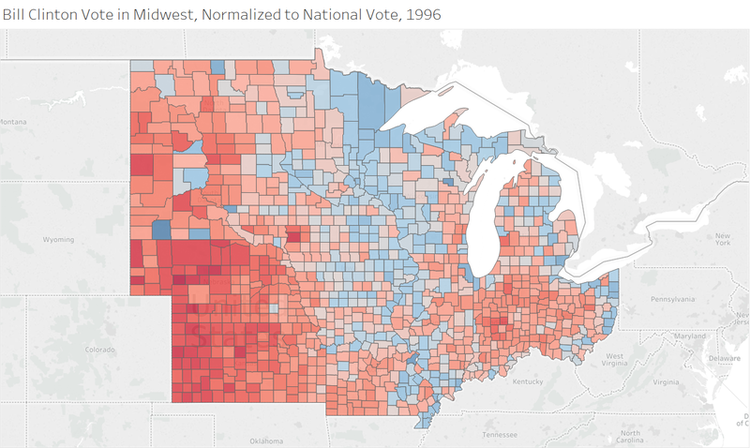 Over the years, Democratic strength in Midwestern rural areas has been on the decline, just as in the South. This tendency became particularly acute during the Obama years. 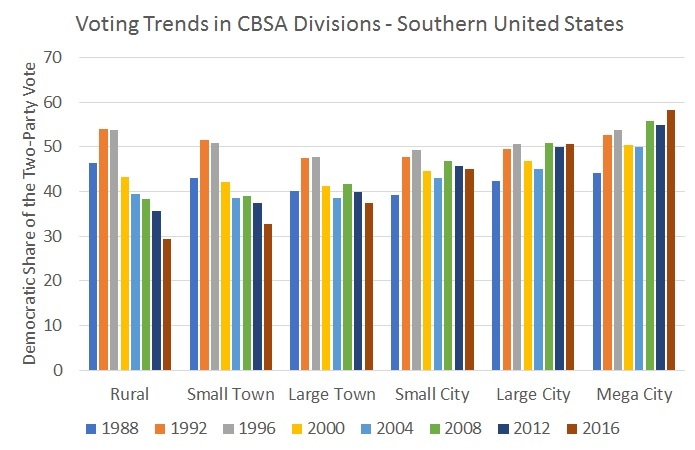 We just didn’t really notice, because the rural areas don’t outvote the cities, as they do in the South. But the polarization reached a point in 2016 where it mattered. 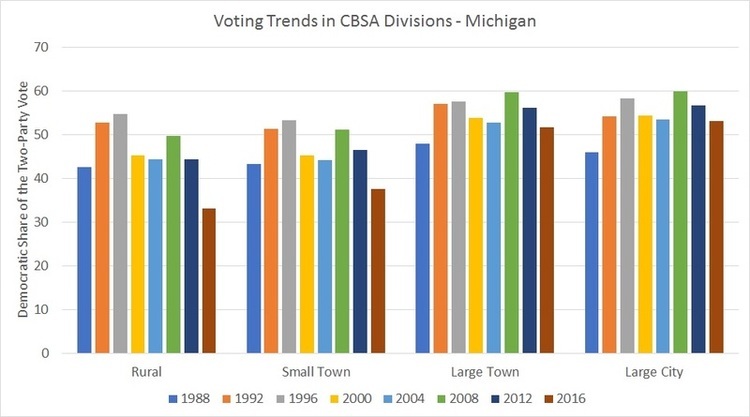 In Michigan, we note similar trends. 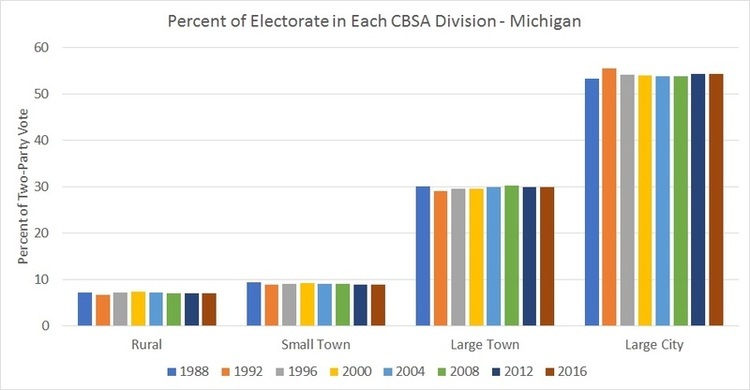 Remember, the Upper Peninsula was once a Democratic redoubt, as was the northeastern quadrant of the “Mitten.” But in 2016, the Democratic coalition basically consisted of Battle Creek, Flint, Oakland County, Ann Arbor, Lansing, and Detroit. Again, this is a lot of votes, but not enough to carry the state. 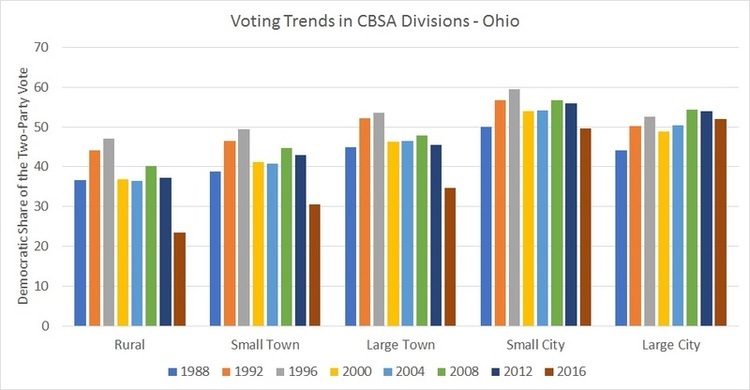 And, again, while large cities cast a lot of votes in Ohio, unlike in Minnesota, they cannot carry a candidate to victory. 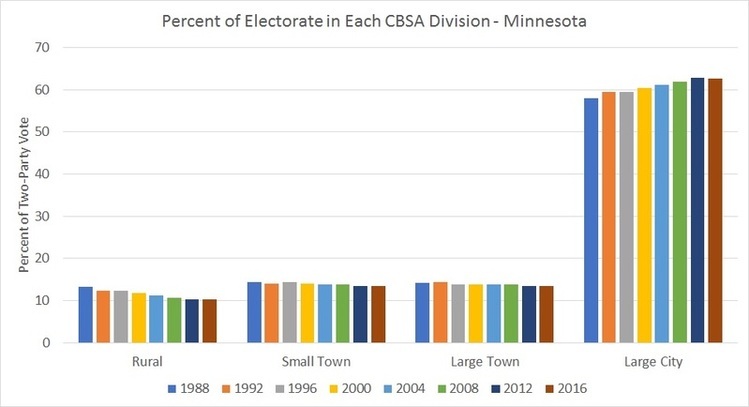 If Democratic weakness in rural areas and towns persists, they will have a hard time bouncing back here. It is a real problem for them. This completes our granular study of the 2016 election. Because this has run quite a bit longer than we anticipated, tomorrow we will add some closing thoughts in a bonus fifth part of the series.